In Viking times, Norse myths predicted the end of the world, an event called Ragnarok that only the gods can stop. When this apocalypse happens, the gods must battle the monsters - wolves the size of the sun, serpents that span the seabeds - all bent on destroying the world. But the gods died a long time ago. Matt Thorsen knows every Norse myth, saga, and god as if it was family history - because it is family history. Most people in the modern-day town of Blackwell, in fact, are direct descendants of either Thor or Loki, including Matt's classmates Fen and Laurie Brekke. But knowing the legends and completely believing them are two different things. When the rune readers reveal that Ragnarok is coming and kids - led by Matt - must stand in for the gods in the final battle, Matt can hardly believe it. Matt's, Laurie's, and Fen's lives will never be the same as they race to put together an unstoppable team to stop the end of the world. I'm not sure the reasons that I decided to pick this up and I'm still not sure if I liked it or not. I think maybe personally I wasn't keen on it but for the target age it was perfect. The main reason, I guess i did pick this up is because of the authors. Both Melissa Marr and Kelley Armstrong are fantastic authors, both of which I have read books and thoroughly enjoyed. I also gave this a spin because it focused on Norse mythology which there isn't much of in fiction and I wanted to read more. 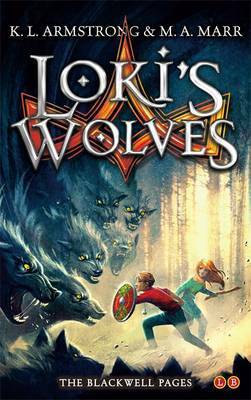 I know Riordan's next series is Norse and the need series touched on it but this seemed like a very full on children's fantasy that would bring Norse mythology to life, and don't get me wrong it did, just something didn't do it for me. This is a children's novel and that is something I need to bear in mind whilst reviewing this. I guess I've become so accustomed to reading YA and adult or maybe it was because I never read anything this simple but I found this too simple. I felt like it told me everything there and then, literally spelling out to me what was happening, and yet with so many words it lacked description. Furthermore the plot was very simple. Now this is my personal opinion but if we go professional then this is a wonderful novel because for the age group this is aimed at this has the simplicity is perfect. For younger and maybe reluctant readers it will be an easy read that they can grasp and enjoy easily. They will love the action packed chapters that leave them on end, I guess the just didn't leave me on end. The story and theme of this is continuously fun. The mythology has been twisted into the story in a smart way making it both interesting and enjoyable. I liked how whilst making it fantasy and action packed the authors used this opportunity to actually educate children about Norse mythology and give some back story to it rather than just to have troll fights every chapter which is my next point. They was crazy thrilling. Every chapter left you gasping for more, and this will you child having many sleepless nights, but in the good way. Cliffhangers were the pinnacle of this, exciting and riveting scenes leaving you thirsting for more. I think when writing an Actioney/Mythological children's fantasy it can often sway towards more of a male book, especially with most in this sub genre having male protagonists but I felt this could easily appeal to girls are well with the use of Multiple POV including a female. In fact the authors have tactfully made each character both unique and interesting whilst easy to follow, remember and understand. There were 3 main characters, meaning it's an easy book to follow and even between the 3 characters there;s a love hate relationship that creates the sort of chemistry you need to keep a book from slumping miserably. As for the writing, as I said above, personally it doesn't do it for me, but however for a juvenile fictions its perfect. Minimal and easy yet still relatable for kids and has the charm of fantasy books. Not an awful lot of description but int he case of children too much will bore them so I think in terms of it being a younger readers novel the authors have nailed it on the head. Overall I think it's a fun snappy fast paced novel, brimming with magic and mythology that will keep any child enchanted whilst they read this book.